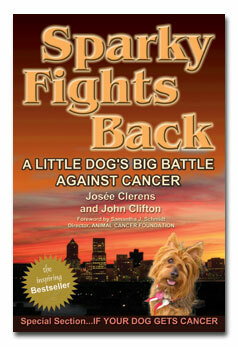 SPECIAL SECTION: "IF YOUR DOG GETS CANCER"
"SPARKY FIGHTS BACK" AMAZON BEST SELLER!! "He is your friend, your partner your defender, your dog. You are his life, his love, his leader. He will be yours, faithful and true. To the last beat of his heart. You owe it to him to be worthy of such devotion." When we think back on all that Sparky did for us, those words certainly ring true. When Sparky got non-Hodgkins lymphoma in 2000, at just six years old, we were pretty discouraged, to say the least. Should we go all out and do absolutely everything we could? Or should we do the minimum and see what happens? It was actually Sparky who gave us the answer. Here he was, courageously trying to live his life, follow his routines, making the effort in spite of the fact that his poor, weakened, disease- and chemo ridden body seemed beyond repair. "Well," we said, "if he himself wants to give it all he's got, then we've got to give it all we've got." Sparky inspired the whole journey. After the first two years of remission, we began writing "Sparky Fights Back." We didn't want our experience and all we had learned to just go to waste, undocumented. It's all because of Sparky's spunky example. Sparky finally left us in January, 2009. He died of general old age, cancer-free, at 14 1/2 years old. Yet, somehow he is still with us, and he continues to encourage and inspire us every day! Lymphosarcoma,Lymphoma,Cancer,Cancer Diet,Cancer Treatments,Pet Cancer,Dog Cancer,Cat,Dogs,Puppy,Dog,Canine Cancer Treatments,Canine Cancer Diet,Hills,Hill's ND,Hill's n/d,Hills,Supplements,Chemotherapy, Alternative Treatments,Herbal,Noni,Noni juice,Supplements,Chinese,Herbs,Holistic Medicine,Medicine, Homeopathic,Homeopathic Treatments,Homeopathy,Pet Cancer Support Site,Delphi Pet Cancer Support Group,Animal Cancer Foundation,Veterinary Radiation, Radiation Facilities, Veterinary Financial Aid, Find vet,veterinary oncology, veterinary oncologists. Canine Cancer Treatments,Pet Cancer Information,Cancer Info,Cancer Treatment Options,Canine Lymphoma,Canine Lymphosarcoma,Oral Cancer,Bone Cancer,Canine Cancer,Sparky, Sparky Fights Back, cancer book, canine cancer book, Sparky's cancer,Sparky's cancer website. Dr. Post, Gerald Post, Bonnie Brown,John Clifton, Josee Clifton, Dr Sheri Segal, Angell Memorial, Animal General,Osteosarcoma,Hemangiosarcoma,Melanoma,Carcinoma,tcc,Transitional Cell Carcinoma,Piroxicam,Doxycycline,Malignant,Malignancy,Gene Therapy. canine cancer ,canine breast cancer,canine prostate cancer ,canine oral cancer,pet scan for breast cancer,bone cancer canine,canine colon cancer,dog cancer,canine tumors,dog melanoma,melanoma dog,cancer dogs,dogs cancer,canine disease,canine oncology,canine lymphoma,radiation therapy,canine leukemia,lymphoma dogs,dog lump,cat tumor,lymphoma canine,canines,herbs,dogs lymphoma,dog treatments,dog swollen glands, canine cancer warning signs.